As per a poll conducted by us across 750 women in 10 metro cities across India, Dark Under Eye Circles is the number one concern faced by a majority of Indian women today is dark under eye circles! ARE YOU TOO SUFFERING AND WANT TO KNOW THE REASONS BEHIND DARK UNDER EYE CIRCLES? Is it poor diet, poor skincare habits, lack of sleep, too much screen time or the genes you inherited from your mom and dad? The sad answer to this question is that it could possibly be a combination of all of the above. Let’s dive into this a bit more so that you understand what are the reasons behind dark under eye circles. SUN DAMAGE - Over-exposure to UVB rays results in uneven pigmentation and age spots. This is because UVB rays trigger abnormal maturity of melanocytes (the pigment producing cells). EXCESSIVE SALT OR CAFFEINE INTAKE - Eating too much salt (especially late at night) can cause your body to retain fluid. This causes puffiness and discolouration in the under eye area. ALLERGIES - Food allergies, seasonal allergies or topical allergies can also exacerbate dark circles. It could also be your makeup that is to blame! 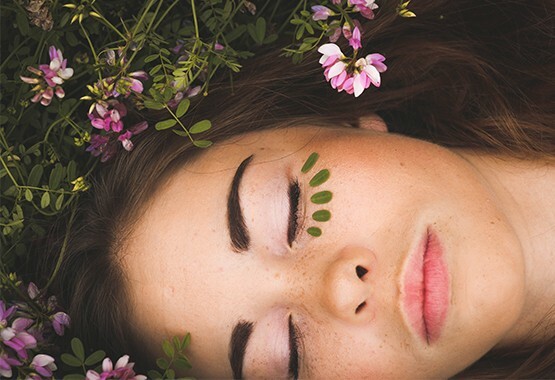 INSUFFICIENT OR EXCESSIVE SLEEP - Sleep plays a key role in those pesky under eye circles and puffiness. SMOKING - Smoking (nicotine) speeds up the process of collagen breakdown in the skin around the eyes. The thin periorbital skin then becomes even thinner. This automatically results in formation of undereye bags and worsening of blue-ish marks under the eye. GENETICS - your DNA might be to blame as well for your dark circles. If you wish to see whether you are genetically programmed to have dark circles, pull out that family album and scrutinise it well. Unfortunately for those of us South Asians, we are predisposed towards what is called periorbital hyperpigmentation. 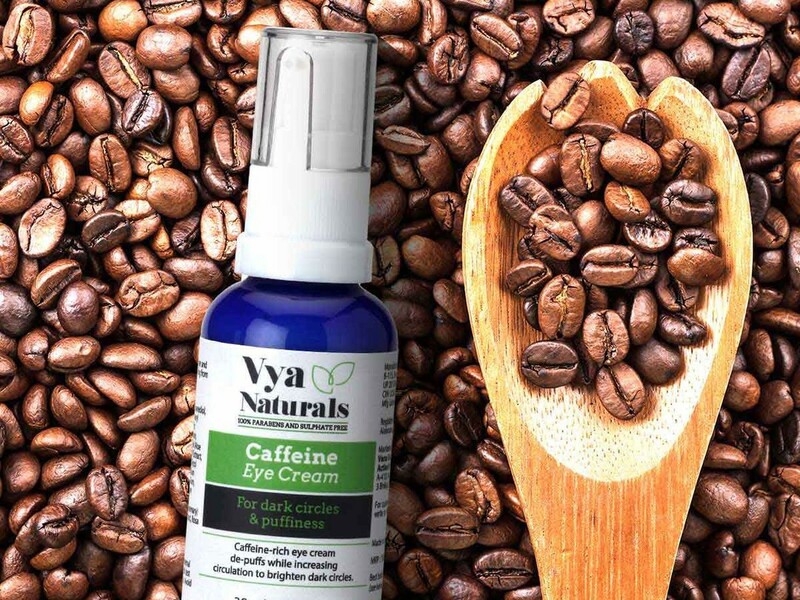 VYA NATURALS CAFFEINE EYE CREAM was created by selecting ingredients that depuff the under eye area, nourish the thin peri-orbital skin as well as hydrate and moisturise the area with anti-oxidant rich properties. 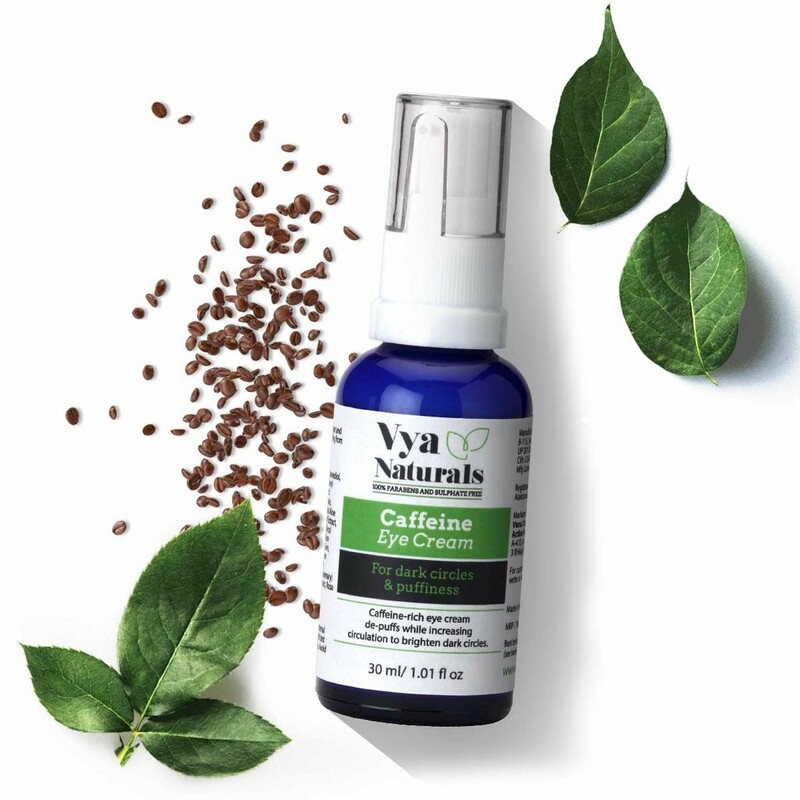 POWERFUL LINES AND PUFFINESS REDUCTION - Vya Naturals Caffeine Eye Cream reduces puffiness, dark circles, fine lines and wrinkles in the delicate skin around the eye area. ANTI-AGEING BENEFITS - Thanks to presence of Vit E and Rosehip Oil. *This offer cannot be combined with any other offer/promotion. Offer T&C Apply. 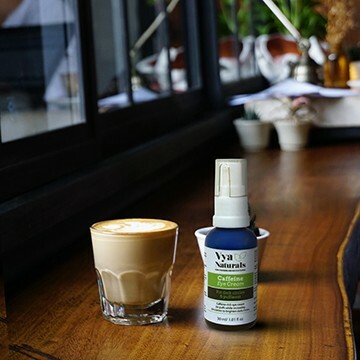 Since the last few years I was struggling with dark circles due to my overall lifestyle, however, ever since I started using VN Caffeine Under Eye Cream, I have noticed a stark difference. My dark circles have almost disappeared and puffiness has reduced. This cream is surely the fuel to my daily skincare routine. I just can't do without it now! Being a student I've to study a lot but I've problem with my sleep as well the result out of it dark circles & tired eyes but this eye cream really help me out treating my problem + it's cruelty free. I'm absolutely love this product !! REDUCED MY DARK CIRCLES AND FINE LINES IN JUST ONE WEEK. TOTALLY LOVING IT. Firstly, I was little skeptical to buy this coz of price but it is totally worth it.I showed results in just one week.I have Under eye dark circles problem but I am using it daily before going to bed and dark circles are reducing and also fine lines are completely gone. 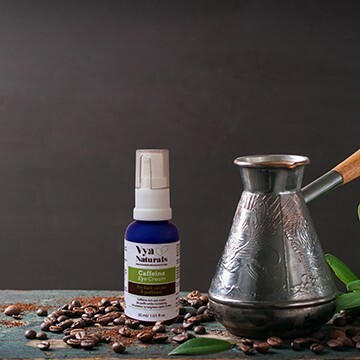 100% Paraben and Sulphate free, this eye cream from Vya Naturals is infused with the goodness of caffeine, Aloe Vera, Olive leaf extract, Avocado Oil, Rosemary Oil, Green Coffee Extracts, Green Tea extract, Rose Hip Oil. All these together help in de-puffing the eyes and increasing circulation to brighten dark circles and fight signs of aging.